A simple question: when do you think the God's Wrath stopped: before the 1000-years government of the righteous, or after that, when the Devil, the beast and all the unrighteous were thrown into the fiery lake? Certainly after that. And look, how the action caused by the 7th trumpet comes to an end: the second coming of Jesus and the resurrection of all the righteous men. There is no sense to harm earth again, to cause the purulent wounds on people. The 7th trumpet has finished the first period. And then the last 7 bowls refer to the period after 1000 years. «And I saw another sign in heaven, great and marvellous, seven angels having the seven last plagues; for in them is filled up the wrath of God. And I saw as it were a sea of glass mingled with fire: And I saw as it were a sea of glass mingled with fire: (Fiery lake under glass); and them that had gotten the victory over the beast, and over his image, and over his mark, and over the number of his name, stand on the sea of glass, having the harps of God. And they sing the song of Moses (Judas) and the song of the Lamb (Christians)...» (15:1-3). 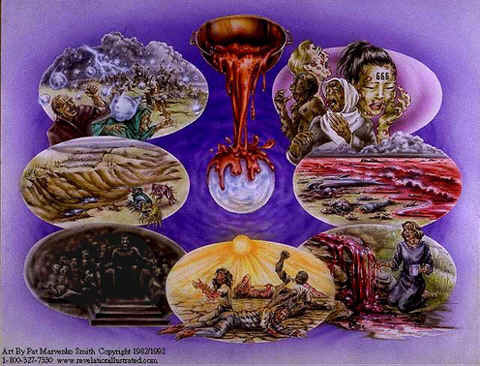 When the bowls of God's anger spill on the ground, those who won the beast are already resurrected (the first resurrection was already held, and after it there are 1000 years of rest), that means that the bowls take place after the 1000 years of rest of the Earth. «And the first |angel| went, and poured out his vial upon the earth; and there fell a noisome and grievous sore upon the men which had the mark of the beast and upon them which worshipped his image. And the fourth angel poured out his vial upon the sun; and power was given unto him to scorch men with fire. And men were scorched with great heat, and blasphemed the name of God, which hath power over these plagues: and they repented not to give him glory. And the sixth angel poured out his vial upon the great river Euphrates; and the water thereof was dried up, that the way of the kings of the east might be prepared. And I saw three unclean spirits like frogs come out of the mouth of the dragon, and out of the mouth of the beast, and out of the mouth of the false prophet. For they are the spirits of devils, working miracles, which go forth unto the kings of the earth and of the whole world, to gather them to the battle of that great day of God Almighty...to the place called in Hebrew Armaggedon. And the seventh angel poured out his vial into the air; and there came a great voice out of the temple of heaven, from the throne, saying: It is done! (it’s the end of the God's Wrath).